Why go with Bjorn’s? 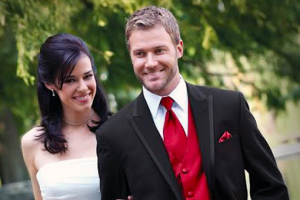 With our combination of fair, affordable pricing and quality (no $200-300 tux/suit rentals at Bjorn’s!). With our sky-high Facebook & Google reviews, it’s nearly impossible to leave without a smile on your face and savings in your pocket. Any style $129.99 or less includes a jacket, pants, shirt, vest, and a tie. We have a huge selection of modern suit and tux styles, which is complemented by a large variety of vest and tie colors. Grooms are FREE with 5 (five) complete rentals! Hemming of pants and pressing of suit included. OUT OF TOWN GROOMSMEN? NO PROBLEM! Don’t know your size? Use this form! View the catalog for our selection of suit styles, colors, and accessory colors. The two buttons below will take you to our distributor’s website, but be sure to stop in our store to schedule a measuring and reserve your suit or tux. Clicking the link below will take you to our distributor’s website. 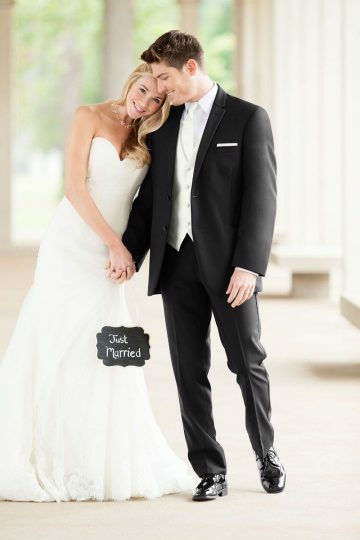 Be sure to stop in our store to schedule a measuring and reserve your suit or tux.